Despite moonlighting on and learning from a championship caliber team, nothing could prepare Coach Wolan as the franchise encountered their most difficult season to date. Through-out the season, the club was forced to deal with nagging roster and participation issues, making it difficult to remain not only competitive, but viable. As the season dragged on, some suspected that it would only be a matter of time before the club would be forced to withdraw from the league. What was Bhavani’s secret technique to run faster? Why was the team denied their only win of the season? What was the scariest moment of Usha's softball career? Why was Coach A-WOL playing on a team in DE? 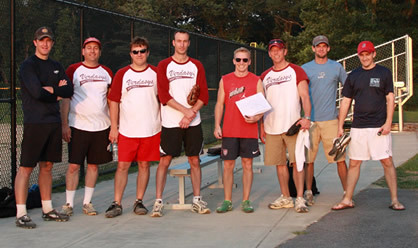 What does the competition think of Verdasys Softball? How did the team manage to lose a game that was PPD? Who tied the team record for most RBIs in a game? How did a flock of geese salute A-WOL during a game? Why didn't Don play in any games this season? Is the player nicknamed "Mike Ditka's wife" real? Who's a better hitter: Grimard, Pete or Lijun? And most of all, "How do I get to the field"? So pull-up a chair, grab some peanuts and Cracker Jacks and enjoy what is quite possibly the best softball team website on the Internet. Game Summary #100 Milestone Reached!